SETI@home is a scientific experiment that harnesses the power of hundreds of thousands of Internet-connected computers in the Search for Extraterrestrial Intelligence ( SETI ). You can participate by running a free program that downloads and analyzes radio telescope data. There's a small but captivating possibility that your computer will detect the faint murmur of a civilization beyond Earth. Help Out - and be part of this International effort. The aim is to find Extraterrestrial Radio Transmission. The SETI Project is funded by entirely by donations, Giant Radio telescopes are scanning space for narrow band signals. Data produced is vast and need super computers to filter out alien signal from naturally accruing radio signals and radio signals produced at home. To fund a project of this scale, entirely on donations, is not a simple task, that is where we come in, to help the SETI team with their data analysis. Chunks of data is downloaded on to your computer from the SETI Server. 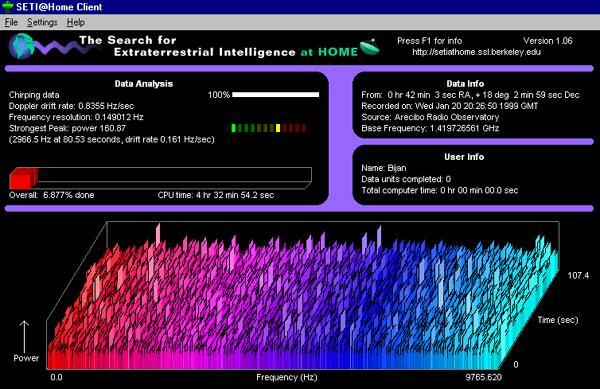 The special SETI Screen Saver Analyses this data when your computer is normally idle. The processed data is then sent back to SETI Server, where it is further analyzed. Installation is easy, but I have only tried it with Windows 95, 98, and NT4 Work Station. Then there is a simple registration process to follow were your details are logged on the SETI Server. Next time your computer is connected to the Internet, you would receive a Data Block, for analysis, which takes about 5 minutes of download time. Your computer will analyze this data when the screen saver is on, and the finished work is passed on to the SETI Server for further analysis, this data analysis could take up to a week, or a few days, it all depends to your computers speed and idleness. For further info please go to SETI@home Web Site.